When I first began this blog, in 2008, I believed that it was okay to use plastic "zip" bags in moderation. I remember saying that nothing else worked quite as efficiently in my small freezer. While their convenience is unquestionable, they are typically single use storage containers and, more importantly, they usually contain toxic chemicals which can leach into our food. Reuseit.com, a company which specializes in reusable products designed to replace single-use items, invited me to try Blue Avocado (Re)Zip Reusable Snack Bags. 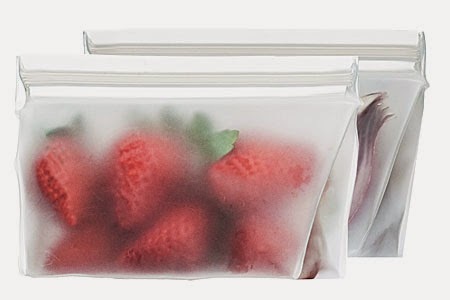 These small bags are made from 100% BPA-free, lead-free, and PVC-free PEVA film. PEVA (polyethylene vinyl acetate) is a non chlorinated vinyl which does not contain phthalates. It does not have the same toxicity concerns as PVC and is considered a safer alternative. At the end of its life cycle, the material biodegrades. The design is well thought out. The gusseted bottom allows one to easily fill the bag and, once full, it sits upright. When empty, the bags are flat making them easy to store. With a capacity of 1 cup (8 ounces), it is the perfect size for adding snacks to a lunch box, backpack, or a purse. Since the bags are freezer safe, one could also use them to freeze things like herbs and spices. bags over and over again. Blue Avocado is a certified B Corp member. B Corporations (or benefit corporations) consider society and the environment in addition to profit in their decision making process. In other words, they do good while earning a wage. To become certified, members must demonstrate that they meet high standards of social and environmental performance, accountability, and transparency. The product comes in Eco-friendly packaging. My bags arrived simply packaged in a cardboard holder. I love reusable products. 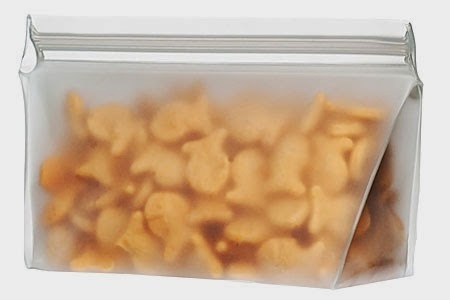 These snack bags can be used over and over, replacing hundreds of single-use, disposable bags. The size helps reduce waste. I tend to like small bites and will keep a bit of leftover dinner for a snack the next day. But sometimes, the only containers I have available are so big that it just seems to take up too much room in the refrigerator or freezer so ... yep ... the leftovers get tossed out. This bag beautifully accommodates those small amounts and doesn't take up a lot of space when full. They are easy to wash. A quick hand wash and these items are good to go. One word of warning ... avoid turning them inside out to wash because that will compromise the seams. Once washed, simply lay them on the counter to dry ... the design keeps them slightly open so they dry easily. The material is sturdy and the double-lock "zipper" is easy to use. If you've ever used "other" bags, you'll know that this can become an issue. The translucent nature of the bags allows one to always know what's in the bag. No more guessing what a container holds ... you'll be able to see the contents. At $9.95 for two, it seems a bit expensive compared to under $5.00 for the "other" brands (which come in large quantities). However, bear in mind that the cheaper bags are used once and tossed out (they are, in fact, considered unsafe for re-use). For the price of approximately 4 single-use value packs, one keeps hundreds of bags from ending up in a landfill. In that light, the price seems reasonable. Overall, I like these snack bags. I definitely like the idea behind them. If you're interested in more information and/or would like to purchase these bags, please click HERE. I received Blue Avocado (Re)Zip Reusable Snack Bags in order to write this review. I received no other compensation. All opinions expressed are mine and mine alone and reflect my honest opinion of the material reviewed. How serious are you about local products?